Tonight I am going totally off topic. 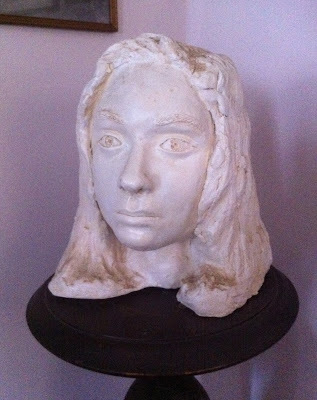 EB of SpiceDish asked for a photo of the bust of myself from high school that I mentioned in my last post. Since EB is so good to us, I thought I would honor her request. Please keep in mind I was only a freshman in high school when I made this! Thanks to Dad for being so great and sending a photo so promptly! I've decided I am going to spread out my experience at Ben & Jerry's over a couple of weeks so that I don't overwhelm you all with one single post. Winter 1995: My sister uses her dining points (due to expire if not used) and brings us home cartons of Ben & Jerry's. This is only the second time I remember having Ben & Jerry's. She brings us the now Flavor Graveyarded Cool Britannia. Fall 1999: I live in a house off campus with friends, including my best friend I have known since elementary school. Late nights are spent talking over a pint of B&J. A tradition is born between friends that will follow us back to our parents' houses in Connecticut, to our apartments in Boston's North End, and to her apartment in New York City. Fall 2006(? ): I am asked to be part of a consumer panel testing a new B&J product. It never makes it to the shelves. Winter 2008: Tina starts Scoopalicious. I join days later. 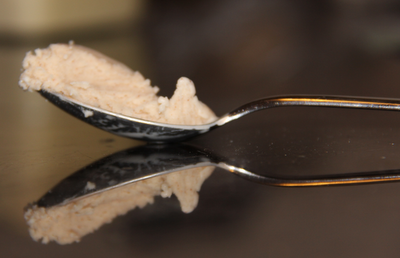 Yet another excuse to both make and eat lots of ice cream, a favorite being B&J. Winter 2011: I am invited to a B&J event at 30 Rock. Little do I know it is the release of Jimmy Fallon's Late Night Snack. I try my hardest to coordinate getting down there with my sister, but it is very last minute and the trip doesn't happen. When I find out later it was Jimmy Fallon (♥♥♥) and B&J (two favorites) I am pretty bummed I wasn't able to go. Winter 2012: I am invited to a VIP blogging event and I spend a wonderful two days in Burlington with four other bloggers, the PR Gurus from B&J and Cone Communications meeting numerous smiling employees of B&J as well as B&J themselves. Stay tuned for the event in more detail! A few months ago I got an email from Liz in PR at Ben & Jerry's asking if I wanted to come up for VIP treatment at the Burlington Office. I told her no, I really don't like ice cream and she should find someone else. Just kidding. I said yes. I didn't write much (ok, or anything) about it because I didn't even know what it was. I didn't know what an amazing experience it would be for an ice cream lover like me. This is just a teaser post though. I can't write too much because we are off to dinner in a few. It's just five of us bloggers total (a perfectly sized group) and our day included a tour of the Waterbury factory, a meeting with Quality Control and Manufacturing, a meeting with Jostein Solheim (CEO of B&J), ScoopU (I am getting to be a pro at the 3oz scoop! ), playtime in Research and Development, and a chance encounter with Ben and Jerry themselves. Photos to follow! Here's a little video of Diana (of cookerati.com) and Kirsten (R&D at B&J) swirling together honey greek frozen yogurt with pistachios with a fig swirl (one of our creations). John (R&D at B&J) and Lindsay of The Stir at Cafe Mom talk in the background. I'm having ice cream for breakfast this morning...I just found out it was Ice Cream for Breakfast Day 2012. I must have known in the back of my head because I bought more ice cream at the store the other day than I have in a long time. Good planning. Lots of choices this morning! Thanks, Bethany, for posting about Ice Cream for Breakfast Day! My grandmother, Florence Rappaport, came up with this idea about 45 years ago and somehow it has taken on a life of its own! It originated as a way to break up the winter blahs on the 1st Saturday in February. My aunt and uncle (Ruth and Joe) are fun people and they had a network of fun friends, and who can resist ice cream anyway? So, people kept up the tradition and now it is an international holiday! My grandmother was always a bit baffled at how this happened! But she would be pleased to know that it is being enjoyed by so many people! If you need inspiration, you can also be inspired by the waffle sundae (photo above) that I posted about the other day. My parents got me a copy of Ellen Brown's Scoop: 125 Specialty Ice Creams from the Nation's Best Creameries for Christmas. The other day I was able to crack it open and made Vietnamese Cinnamon Gelato (adapted from Cold Fusion Gelato in Newport, Rhode Island). This flavor is among one of my husband's favorites. I love it too. This is great since I have a Costco sized purchase of Vietnamese (Saigon) Cinnamon. This book is among one my new favorites. I highly recommend it! I must go to Newport for some Cold Fusion! It's good news that I can get Cold Fusion at Whole Foods in the meantime. Tina and I are often get emails from companies asking if we want to try their products. Since we both love getting mail and packages, if we can find a way to work the product in with ice cream, we are quick to agree! A few months back we got an email asking if we wanted to try Smucker's Snack'n Waffles. Well, sure! I wasn't quite sure how we'd work it in, but we'd figure out a way. We got coupons in the mail, but took me a while to pick up my box of waffles since my regular store didn't carry them. I finally picked them up today. My husband is at the gym and I am eating a waffle sundae. 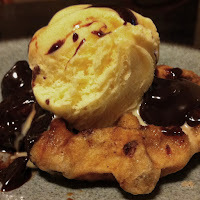 A chocolate chip Snack'n Waffle, a scoop of vanilla and some hot fudge sauce I had lying around (yes, it happened to be Smucker's Hot Fudge as well!). Not the most beautiful creation, but it sure was good...A waffle-y cone type thing going on, some vanilla, and some syrup flavor (it's baked right into the waffle) and lots of chocolate!